consider in creating our future leaders. Click the links below to download for free the entire issue or individual articles. To order a hard copy, click here. 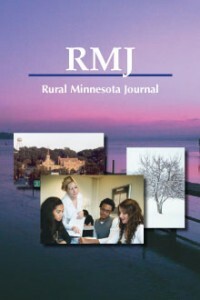 Or, check out past issues of the Rural Minnesota Journal. rural hometowns, and if so, what are they hoping to find when they get there? are going on to connect kids with the many options in health care careers. The higher-than-average rate of out-of-home placements among American Indian children is having lasting effects on not only the children, but their families, the community and the tribe. Education plays a vital role in a child’s future leadership potential. Joyce outlines four components necessary in education to create future leaders. What’s so great about living in a rural community? That’s what rural residents need to figure out if they want to attract people to their town, then get that message out there. Young people are the perfect candidates to be entrepreneurs, and there are a number of reasons they can and should be encouraged. farming in the past and farming today, and what needs to be considered for preserving farming into the future. As with everything, local government is also changing, adapting to new technology and new ways of doing things. Young people have distinct opportunities ahead of them in smaller communities that they may not have access to in an urban setting. To download past copies of RMJ, click here. Would you like to automatically receive all the Center’s future publications, including RMJ? Just become a supporting member of the Center. To learn more, click here.